In case you haven’t been paying attention, it is roadmap season at AMD, and now it is Desktop CPU time. A big welcome goes out to Vishera, Kaveri, and Kabini. This time, it isn’t exactly anything we weren’t expecting, with two of the three code names, Kabini and Kaveri, floating for a long time. Vishera is new, but the chip itself is basically a Piledriver server CPU in desktop form. Nothing too spectacular. More interesting is Kaveri, the successor to Trinity. 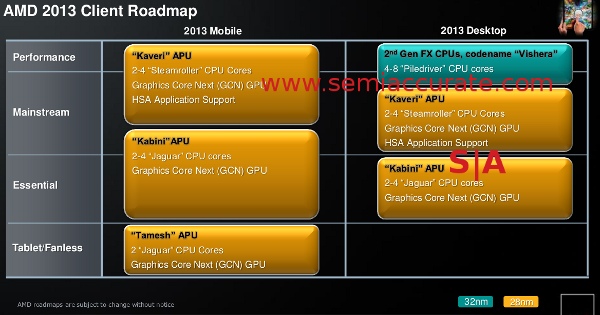 It will have a Steamroller CPU core, likely the first chip on the market with it. It also has a GCN/Southern Islands/HD7000 GPU, plus today’s obligatory catch phrase, HSA. This is where it begins.